A great way to grade your experience. There's nothing quite like a conservatory to fill the senses & I got that from both your words & the pictures. Thank you, Jo, for linking up and supporting Wellness Wednesday. I look forward to reading your updates. Wow, Natalie, the gardens sound heavenly. What a great wellness activity on several fronts. Thank you for inviting me to participate in Wellness Wednesday. I look forward to reading some of the other posts. Happy Wednesday! Thank you, Christie, for joining us. I'm excited about this link up this year. Hope to get more participation. Happy Wednesday! Those gardens look so pretty and tranquil, I can't think of a nicer place to do all those exercise intentions. Thank you, Deb, for stopping by. Feel free to join us in today's link up or in future months. I was pleased with how well my outing to the Winter Flower Show turned out. They make fitness fun. I look forward to reading more about your fabulous 50. What a lovely venture! I like how you broke the experience down into a treat for each of the senses. This morning I was especially mindful of the sunrise because I am participating in a photo challenge for which this week's prompt is 'morning'. A shame it took that prompt to encourage me to notice the sunrise. It was gloriously pink and coral. A real treat. So thankful to your for this wellness series. Looking forward to another great year as we work toward healthier versions of ourselves. Your sunrise sounds beautiful. Thank you, Leslie, for hosting this WW link up with me. We're off to a great start. Thank you, Min, and Happy New Year to you! I look forward to reading your updates and your new ZTT link-up. Please feel free to join in this Wellness link-up. You're very welcome, Min. I hope your ZTT link up grows and grows. My next Wellness link up is on February 13. See you then! Thank you, Sue, for joining in the Wellness link up. I'm excited about this year's Wellness Wed. It looks like we're all off to a great start. I know we'll cheer each other on throughout the year. I look forward to reading about you fit and fun outings. Reading this from MLSTL, I saw the link about the Wednesday Wellness posts. I added a link from several months ago. It's not a new post, but still fits in with the 'Fresh Start' theme. It was in September when I found a fresh start that showed me how much some regular physical activity (with cardio!) benefits how I feel. Thank you for this and I'll look forward to more Wellness Wednesdays. Welcome, Trisha, to the Wellness link up! Thank you for sharing your discovery of kickboxing with us. The optional prompts and dates for future Wellness link ups are in my post. I look forward to reading your next WW post. Great activities to incorporate into our lives this year, Natalie! I'm in for yoga twice a week. I've overdone the running this summer. So glad you're also in for yoga 2x/ week, SSG. I like to mix up my fitness activities to keep it fun and to avoid repetitive injuries. 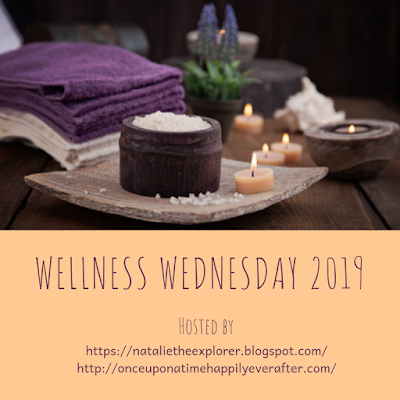 Please feel free to join this monthly Wellness Wed. link up. Oh lovely - the flowers look gorgeous. I like the idea of wellness posts and so might join in. I want to refocus on my health and fitness a bit this year. Well... wellness in general I guess. Please feel free to join in the Wellness link up in any or all months. I look forward to reading your posts. Happy 2019, Deb! Hi, Natalie - I continue to be inspired by your posts, your endless energy, your fitness and your travel! You have made an awesome start to 2019. I look forward to reading more! What a great idea to get out and keep fit. Most of my walking is circular, though I do use it as a chance to catch up on my passion for politics by listening to podcasts! Thank you, Emma, for your comment. Walking and listening to podcasts make double use of your time. Two birds one stone! Those floral displays are stunning, wouldn't take much convincing to get me out walking amongst that beauty. Thank you, Nikki, for your visit and comment. The staff at the Conservatory did a wonderful job and put on a beautiful Winter Flower Show. Fit and fun, two birds one stone. Thank you for stopping by. It is so true that we are more likely to stick with fitness goals if we have fun doing it. I enjoy walking on the trails near my home and always feel happier and healthier after a walk in nature. I think "fitness rule #1" should be "Choose an activity you enjoy". The rest will fall into place. I love your goals for being in nature and finding humor in something daily! It's so easy to only see a glimpse of nature out the window at work or while walking from your car to a building, so I think it's a wonderful idea to make a conscious effort to spend time in nature and reset yourself. I've said this on a couple of other posts, but I'm glad I'm late writing my Wellness Wednesday post so I can "borrow" a lot of these ideas! Thanks, Amber, for stopping by. If you live close to nature, take advantage of it to make your walks more interesting and calming. Humour is a great stress manager :) Feel free to join the next Wellness Wednesday link up on Feb 13. Optional prompt Healthy heart. That's such a smart way to evaluate your outing. It shows how beneficial it really was for you! We have a garden like this nearby, and it'd be the perfect place to go in the winter. But it's part of the botanic gardens so I don't think about it in the cold weather. These gardens are wonderful, Jo, especially here in the winter when we lack vibrant colours. Thank you for stopping by. Well-done on the incorporation of all the senses as you went along. I do try to do a lot more of that. It is the best way to remain mindful for me. Found you today on Min's first #ZTT link up. Thank you, Denyse, for your comment. Being mindful of my senses seems to heighten the experience. Have a great weekend!